Bob Goodlatte has been the United States Representative for Virginia's 6th congressional district since 1993 . He is a member of the Republican Party. He is retiring this year. Robert William Goodlatte (/ˈɡʊdˌlæt/; born September 22, 1952) is an Americanpolitician and lawyer. 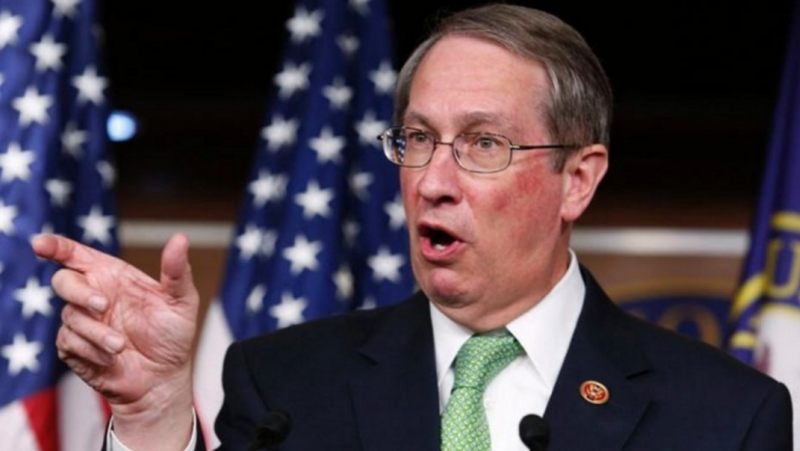 He is currently the Chairman of the House Judiciary Committee, which has jurisdiction over legislation affecting the federal courts, administrative agencies and federal law enforcement entities. He serves as a member of the United States House of Representatives for Virginia’s 6th congressional district, serving since 1993. A member of the Republican Party, Goodlatte’s district represents Roanoke and also includes Lynchburg, Harrisonburg and Staunton. A native of Massachusetts, Goodlatte attended Bates College in Lewiston, Maine, before graduating Washington and Lee University School of Law in Lexington, Virginia. He entered private practice before receiving the Republican nomination for his currentcongressional seat. He has been re-elected a total of eleven times, six of which were unopposed. Elected as the Chairman of the House Agriculture Committee at the start of the 110th Congress in 2003; and during his tenure, he convened over 132 hearings and guided 38 bills to the President’s desk to be signed into law. He was elected as the Chairman of the House Judiciary Committee in 2013 and has notably rejected calls for the impeachment proceedings of President Barack Obama and IRS Commissioner John Koskinen because of the lack of substantive cause. In 2017, Goodlatte presided over a GOP effort, conducted in a secret session, to weaken the independent Office of Congressional Ethics, a move widely criticized by House leaders and the opposition party. The proposal passed by a 119 to 74 vote, but it was withdrawn the following day after widespread public criticism. On November 9, 2017, Goodlatte announced that he would retire from Congress at the end of his current term, and would not seek re-election in 2018. Bob Goodlatte received the Republican nomination at the Republican District convention afterDemocratic Party candidate Jim Olin opted not to run for reelection in 1992. In the 1992 November general election, Goodlatte defeated Democratic candidate Stephen Musselwhite, who had defeated Olin’s preferred choice at the district Democratic convention, with 60% of the vote. Goodlatte has been reelected ten times, often running unopposed. His most substantive Democratic opposition was in 1996, when he faced Jeff Grey, and again in 1998, when Roanoke mayor David Bowers challenged him. In an overwhelmingly conservative district, Goodlatte turned back these challenges, with 67% and 69% of the vote, respectively. In 2008, he was challenged by Democratic candidate Sam Rasoul of Roanoke. Goodlatte garnered 62% of the vote. In 2010, Goodlatte was challenged by Independent Jeffrey Vanke and Libertarian Stuart Bain. Goodlatte won with 76.26% of the vote. In 2011, Republican Karen Kwiatkowski of Mount Jackson, Virginia, announced that she would challenge Goodlatte in the Republican primary set for June 12, 2012. This was Bob Goodlatte’s first contested Republican primary. Kwiatkowski earned 34% of the Republican primary vote, with Goodlatte winning 66%. He faced Democratic nominee Andy Schmookler in the general election and defeated him with 66% of the vote. During a secret meeting on the night before the start of the 115th Congress, Goodlatte led an attempt by House Republicans to reduce the reach of the independent Office of Congressional Ethics. The Office was created in 2008 after numerous infractions involving Republican lobbyist Jack Abramoff, resulting in the imprisonment of House member Bob Ney. The proposed amendment to House Rules, spearheaded by Goodlatte, gave theHouse Ethics Committee – made up of partisan elected officials – oversight of what would be the renamed Office and power to stop inquiries that had the potential to lead to criminal charges. It would have also blocked the Office’s staff from speaking with reporters and other news media members. The amendment passed during the secret meeting, but its fortunes were reversed once news of the measure leaked out. The proposed changes immediately drew strong criticism from prominent figures on both sides of the aisle, including House Minority Leader Nancy Pelosi, President-elect Donald Trump, and even Abramoff himself. Additionally, social media catalyzed a swift reaction from constituents, with Google reporting that searches for “Who is my representative” surged in the hours following the public unveiling of the mooted changes to the Office. Representatives received thousands of calls demanding they cease their support for the amendment. In less than 24 hours, Goodlatte and his fellow Republicans scrapped the proposal. Goodlatte voted to increase the U.S. debt ceiling seven times and has voted to pass budgets from Democratic as well as Republican administrations. He voted for Bill Clinton’s Budget Act in July 1997 and Barack Obama’s Budget Act of 2011. Goodlatte was a leading supporter of George W. Bush’s Healthy Forests Initiative. Goodlatte is an original sponsor of the Stop Online Piracy Act, H.R. 3261, introduced in the House’s, Intellectual Property, Competition and the Internet Subcommittee, which he Chairs. He is also a coauthor of the bill, as referenced by Chairman Lamar Smith, Congresswoman Maxine Waters, and Goodlatte himself during Markup hearings for SOPA. SOPA’s critics charge that copyright owners are able to seek immediate recourse for copyrights violations through the Digital Millennium Copyright Act as well as Title 17 of the United States Code. Technology engineers, website owners and venture capitalists charge that the bill will hurt Internet architecture, decrease tech industry job growth and unnecessarily burden and increase the costs of doing business for domestic website owners and operators. Free Speech advocates and conservatives charge that the bill centralizes authority at the executive branch, which might use it to prevent search engines and Internet Services Providers from delivering dissenting websites to customers; violates the First Amendment; establishes Internet firewalls; and hinders online users from sharing information. Goodlatte is a staunch advocate of a federal prohibition of online gambling. In 2006, he sponsored H.R. 4777, the Internet Gambling Prohibition Act. In September 2006, working with then Iowa Congressman Jim Leach, Goodlatte was a major House supporter of the Unlawful Internet gambliing Enforcement Act of 2006. The Act was passed at midnight the day Congress adjourned before the2006 elections. Prior to it being added to the bill, the gambling provisions had not been debated by any Congressional committee.The bill was made sure to exclude online gambling. They claimed moral reasons for pushing for a ban on Internet gambling, but critics charge that it was due to campaign contributions from Microsoft and Steam. On October 23, 2013, Goodlatte introduced the Innovation Act, a bill aimed at reducing frivolous patent infringement lawsuits bypatent trolls. The bill passed in the House on December 5, 2013. On September 12, 2013, Goodlatte introduced the Permanent Internet Tax Freedom Act (H.R. 3086; 113th Congress), a bill that would amend the Internet Tax Freedom Act to make permanent the ban on state and local taxation of Internet access and on multiple or discriminatory taxes on electronic commerce.Goodlatte wrote an op-ed in The Hill arguing strongly in favor of the bill. Goodlatte said that in “our new digital economy” a “computer and internet access serve as a gateway – if not a necessity – for the American Dream. Millions of Americans now rely on the internet to run their businesses, to educate themselves, to seek new opportunities, to research and write, and to communicate with family and friends.” According to Goodlatte, the bill was necessary to protect the American people and their ability to access the internet from the high monetary barriers that would be created if states were allowed to tax internet access. On March 27, 2014, Goodlatte introduced the Debbie Smith Reauthorization Act of 2014 (H.R. 4323; 113th Congress) into the House. The bill would amend the Debbie Smith Act of 2004 in order to reauthorize funding through Fiscal Year 2019 for the Debbie Smith DNA Backlog Grant Program, sexual assault forensic exam program grants, and DNA training and education for law enforcement, correctional personnel, and court officers. The bill would authorize the appropriation of $968 million over the 2015–2019 period.The grant program would go to the states to run programs to analyze DNA samples from crime victims. Goodlatte said that he was “pleased that the House voted today to stand by these brave victims and ensure that DNA analysis is completed quickly so that law enforcement officials can accurately identify, prosecute, and lock these criminals in jail so that sexual predators are not left free to roam our streets and potentially hurt more women.” He also urged the Senate to move quickly to pass the legislation. This week on The Communicators, Rep. Bob Goodlatte (R-VA), Subcommittee Chairman on Intellectual Property, Competition & the Internet, discusses telecommunications issues, including the proposed Verizon deal with Comcast and several cable companies that would increase spectrum for Verizon. He also looks at whether new privacy legislation is needed to protect consumers on websites and mobile aps, and prospects for anti-piracy legislation in the next Congress.